What Day Of The Week Is December 3? 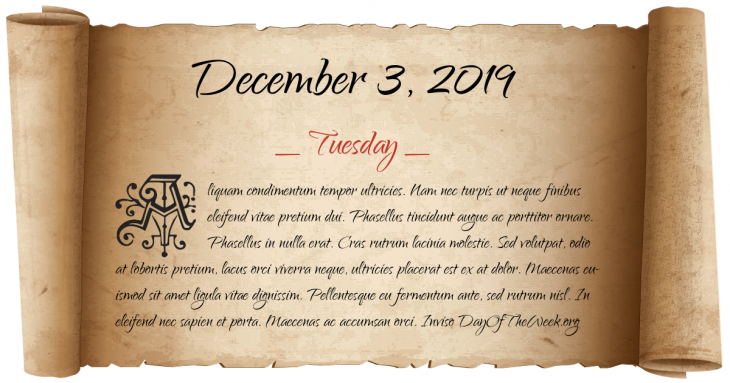 December 3, 2019 is the 337th day of the year 2019 in the Gregorian calendar. There are 28 days remaining until the end of the year. The day of the week is Tuesday. War of the Second Coalition: Battle of Hohenlinden, French General Moreau defeats the Austrian Archduke John near Munich decisively, coupled with First Consul Napoleon Bonaparte’s victory at Marengo effectively forcing the Austrians to sign an armistice and ending the war. In Cincinnati, Ohio, 11 fans are suffocated in a crush for seats on the concourse outside Riverfront Coliseum before a Who concert. Winter storms cause the Chehalis River to flood many cities in Lewis County, Washington, also closing a 20-mile portion of Interstate 5 for several days. At least eight deaths and billions of dollars in damages are blamed on the floods. Who were born on December 3?